(NaturalNews) As West Africa continues to contain the worst Ebola epidemic in history, a completely separate outbreak has emerged in the Democratic Republic of Congo (DRC). On September 11, the World Health Organization (WHO) announced that the number of Ebola cases in the DRC had doubled within one week, bringing the total to 62. By that time, 35 people had died from the disease. The Ebola virus is transmitted via close contact with contaminated bodily fluids such as blood, diarrhea and vomit, and kills between 50 and 90 percent of those infected. The spread of another strain in West Africa has been so rapid that local health facilities have been completely overwhelmed. 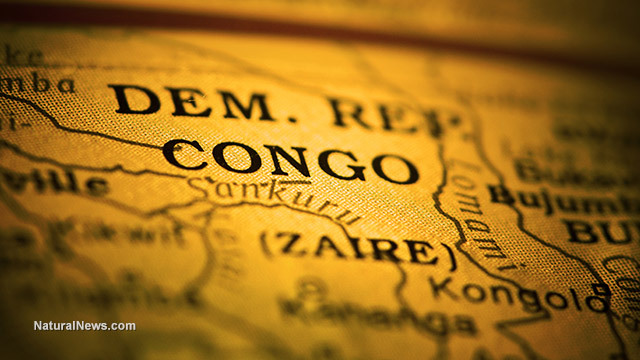 The DRC outbreak, first announced on August 26, has now been confirmed through genetic testing to be "definitely not a dissemination of the outbreak in West Africa," said virologist Eric Leroy of the International Centre for Medical Research of Franceville, Gabon. The analysis confirmed that, while the two viruses are of the same species (Ebola-Zaire), they are genetically distinct. The DRC strain differs from the West African strain by a total of seven mutations (out of 346 base pairs sequenced). In contrast, it is only four mutations different from the first identified strain of Ebola and just three mutations different from the strain that caused the 1995 outbreak in Kikwit, DRC. The new DRC outbreak is localized to a remote region 1,200 km (750 miles) north of the capital of Kinshasa. It is believed to have been caused by a woman who butchered bush meat. Ebola outbreaks typically begin from the slaughter and consumption of infected wild animals. The WHO said that DRC has already mobilized a strong response to the outbreak. "Motorcycles, canoes, and satellite phones have been supplied to facilitate outbreak investigation and contact tracing," the UN agency announced. "A dedicated helicopter will be made available soon." While the remoteness of the area may provide obstacles, it is also likely to limit the spread of the disease, Leroy said. "The DRC [also] has much experience with Ebola outbreaks, so all the people know very well what to do to stop the outbreak," he said. The emergence of a new outbreak highlights the warnings issued in a recent study by researchers from Oxford University, that future Ebola outbreaks are much more likely than had previously been thought. Because Ebola is not typically found in humans, an outbreak must be triggered by what researchers call a "zoonotic event," in which the virus jumps from an animal to a human being. Zoonotic events are also said to be responsible for the H1N1 swine flu pandemic, as well as the initial infection of humans with the virus that would evolve into HIV. In the new study, researchers analyzed which regions of Africa have the traits favorable for new zoonotic Ebola events. They found that an astonishing 22 countries containing 22 million people are at risk. Fifteen of these countries have not yet documented a case of zoonotic transmission but were found to be at risk. "Up until now there hadn't been a huge amount of research, but there was one paper in which the at-risk area was much smaller," researcher Nick Golding said. "It didn't predict, for example, the area in Guinea where this current outbreak first started." Health officials continue to call for an emergency response to contain the West African epidemic. "Ebola treatment centers are reduced to places where people go to die alone, where little more than palliative care is offered," said Joanne Liu, International President of Doctors Without Borders. "It is impossible to keep up with the sheer number of infected people pouring into facilities. In Sierra Leone, infectious bodies are rotting in the streets. Rather than building new Ebola care centers in Liberia, we are forced to build crematoria."